On a night when Oregon City played without star tailback Zakayas Dennis-Lee because of injury, the Pioneers found other options. Lots and lots of other options. Oregon City's Calvin Green and Wyatt Lovell scored two touchdowns each, pacing the Pioneers to a 60-35 win over the visiting Grants Pass Cavemen in Friday's opening round of the OSAA Class 6A football playoffs at Pioneer Memorial Stadium. Austin Canchola, Colby Iverson, Hunter Manassero, Matthew Petersen, and Zachary Woods added one touchdown each to help send the Pioneers (5-5) into a second-round match-up against top-ranked Lake Oswego, a 42-6 winner over North Medford. Leading 34-28 at halftime, the Pioneers scored on their four possessions of the second half, blowing the game open when Woods scampered 23 yards for a touchdown that pushed the lead to 60-28 with 5:14 to play. Iverson, the Pioneers senior quarterback, had a sensational game, completing 25 of 30 passes for a season-high 383 yards and six touchdowns, while rushing 12 times for 63 yards and another score. "I'm really proud of our kids and how they played," Pioneers coach Dustin Janz said. "We had some young guys step up. Through the year, they've stepped up each week, but this week was kind of the culmination of that against a good Grants Pass team." The Cavemen (6-4) stayed close until the start of the third quarter when their first four possessions ended with a punt, a fumble, and two more punts -- all in Grants Pass territory. "Right now, a playoff loss is a playoff loss," Grants Pass coach John Musser said. "This season had a lot of ups and downs. We upset a couple teams down south and that was pretty fun, but this is a group of seniors that have played a lot of football. "A handful of them played as sophomores and they've won of a lot of football games in their careers as Cavemen and I'm awfully proud of them." 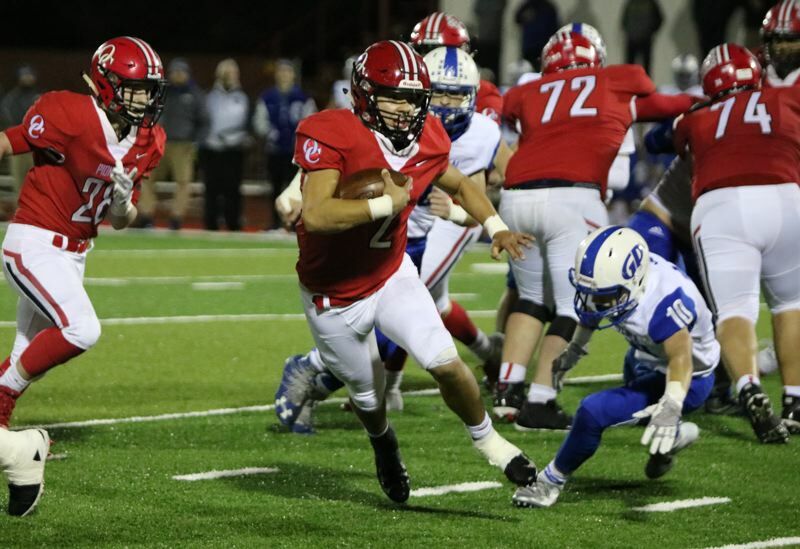 Oregon City had beaten Grants Pass 64-41 in the season-opener in August, but this time they were without Dennis-Lee, who rushed for 1,248 yards and scored 22 touchdowns before he injured his right foot playing defense in the regular-season finale against West Linn. The Pioneers have no idea how serious Dennis-Lee's injury is and they're hoping he can return for the Lake Oswego game, but his absence on Friday against Grants Pass turned into a rallying point for the rest of the team. "We were all playing for Zee," Lovell said. "It was such a crummy thing that happened with him, but we knew it's win or go home and we all had to step it up and we all had to play the best of the best." Added Petersen: "We all came together and took care of business. At the beginning of the week, we were questioning things a little bit, but everything fell into the right hands and we did what we did." "We knew Grants Pass was going to load the box to stop the run because we'd run for some ridiculous number (562 yards) the first time we played," Janz said. "So we added two blockers were also threats as receivers." Musser said the Cavemen struggled to adjust to Oregon City's additional blockers up front. "We saw a tight end like maybe two or three plays all season, but with their stud running back out, it was just a way for them to take over the game and shorten the game for themselves," Musser said. "With that group of kids, that's something you might have looked at all season, because they've got some road graders up front, and with that tight end in there … we were no match for them up front." The Pioneers also turned to the back pages of their playbook for a seldomly-used shovel-pass play to the wide receiver on an end-around, which they ran twice with Robert Boland and twice with Lovell. Both times Lovell ran it in the red zone, he scored. "I'm just a kicker and I run track," Lovell said. "This was one of my first couple of games playing wide receiver, but the coaches wanted to use my track speed so they just threw that play in and we went for it. It was pretty cool." The game started out as a bit of a track meet with the score changing hands four times in the second quarter. After Grants Pass quarterback Chase Coyle threw a 41-yard touchdown pass to Randy Clark to give the Cavemen a 28-27 lead with 1:12 left in the half, Iverson turning around and threw a 42-yard touchdown strike to Canchola with nine seconds remaining to put Oregon City back on top 34-28. One of the key turning points in the second half came after Lovell scored his second touchdown to make it 40-28 and Grants Pass got the ball back at its own 25-yard line. On second-and-4 from the 31, Coyle threw a pass to Jaren Emptage, but Petersen jarred the ball loose and Green recovered for Oregon City at the Cavemen 46. The Pioneers then went on a nine-play drive that ended with Iverson following the left side of his offensive line into the end zone from 13 yards out to make it 47-28 with 1:29 to play in the third quarter. "It was a game of momentum and a game of possessions at that point and that extra possession they got … yeah, that was a big one," Musser said. "And Colby Iverson, he's one of the better quarterbacks we've seen all year, so my hat goes off to him and that offensive line." Iverson completed passes to nine different receivers with Green leading the way with seven receptions for 149 yards, including touchdown catches of 37 and 56 yards. Canchola had four catches for 70 yards with one touchdown, and Heath added four receptions for 51 yards. Hunter Manaserro led Oregon City's ground game with 31 carries for 95 yards, including a 1-yard touchdown run that gave the Pioneers a 26-14 lead with 5:02 to play in the first half. "Zee (Dennis-Lee) brings a great dimension to the team, but I think tonight we kind of had to find a different identity without him," Iverson said. "Guys stepped up from Calvin Green to Austin Canchola to Wyatt Lovell to everyone else who got touchdowns tonight." For Grants Pass, Coyle completed 21 of 31 passes for 294 yards and five touchdowns -- four to Clark and one to Korbin Lopez. Emptage added a team-high 73 yards rushing on 15 carries. Looking ahead, the Pioneers, with our without Dennis-Lee, will need another strong effort on both sides of the ball to compete with Lake Oswego, which defeated Oregon City 63-17 on Sept. 14 at Lake Oswego. "Every day is a blessing that you can plan another down of football," said Iverson, one of 18 seniors for the Pioneers. "For a lot of guys, once it's over, they're never going to step on the field again. "It's just crazy to think about that every time I step on the field, and it's probably that way for a lot of guys, but this could be it. We just have to make the most of it and know that anything can happen, especially in the playoffs."